Viticulture and winemaking in New Zealand go as far back as 1819, with the first vines being introduced to the land of the wingless Kiwi bird and fierce indigenous Maori by intrusive English missionaries. For centuries, this South Pacific two-island country was known for having more sheep than human beings. It didn't help that the country was located in some remote place to the east of Australia and west of Chile that didn't have top-notch public relations. But in the mid-1980s New Zealand's fledgling wine industry started popping up on wine enthusiasts' radar screens. What lowered New Zealand wine's cloaking device? Sauvignon Blanc. By the mid-1990s this varietal alone had kick-started phenomenal growth of wineries and production and created the identity for New Zealand wine. But the toe-tingling and brilliant Sauvignon Blanc is not the only Kiwi wine out there. Not as heavily exported, New Zealand also produces broad-flavored Chardonnay, Riesling, evolving and nuanced Pinot Noir, virile Cabernet Sauvignon-Merlot, and sparkling wines. But let there be not mistake, Sauvignon Blanc was a big flashing neon sign to wine drinkers; it got everyone's attention. New Zealand ranks as the 33rd biggest wine-producing country in the world, and the primarily beer-guzzling country is the 28th wine-consuming country in the world. Not bad considering that the more than four million Kiwis drink approximately 12 liters of wine per year. Outstanding consumption, but they still can't drink as much as they produce. In 2006, there was a total volume of 133 liters produced with domestic consumption of 50 million liters and 58 million liters exported. Based on these numbers and the growing number of wineries added each year--there are 530 in 2006 as compared to 238 in 1996--New Zealand's wine industry relies and will continue to rely on a thriving export market to keep afloat. New Zealand wine comes from ten main wine-growing regions that are diverse. The North Island region is warmer while the South Island is cooler. Both deal with maritime influences and abundant rainfall that dictate terms and challenging conditions to the wine growers. The top ten regions for New Zealand wine are Auckland, Waikato/Bay of Plenty, Gisborne, Northland, Hawke's Bay, Wellington, Nelson, Marlborough, Canterbury, and Central Otago. The two most important and largest wine regions on North Island are Gisborne and Hawke's Bay. 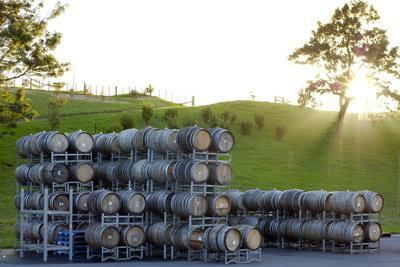 Auckland has small vineyard acreage but boasts some of New Zealand's top wineries. Wellington, in the southeast part of the North Island, produces some of the best Pinot Noir in the country. On the South Island? Not to denigrate any other region, but Marlborough is the one for Sauvignon Blanc and the most prestigious wine region. Keep in mind that in New Zealand, many wineries don't own vineyards or grow their own grapes but buy from over 500 independent growers. That's why an Auckland winery such as Matua, still produces a Marlborough Sauvignon Blanc. It's world-class and the vibrant Sauvignon Blanc casts a large shadow over all other New Zealand wine. Don't discount a Cabernet Sauvignon from Hawke's Bay or a Chardonnay from Gisborne, and Pinot Noir is an emerging varietal for New Zealand. This may be true, but that's all relative in comparison to Sauvignon Blanc. When I taste this New Zealand white wine I always think of exotic, bouncy, crisp, tropical and citrus fruit wines, and the color green. The green is not pronounced in a derogatory way, nor does it have anything to do with Ireland and leprechauns, no, no. This is the green of limes, fresh herbs, melons, green beans, peppers, and gooseberries. These wines are clean and full of zesty flavors that are layered and focused. When it comes to food and white wine, skip the Chardonnay and go for Sauvignon Blanc. It's one of the friendliest wines with food and matches up well with seafood, poultry, salads, and vegetarian dishes...and don't forget the soft cheese either. Lamb? I'd probably go with an Aussie Shiraz. It is often difficult to find any export New Zealand wine other than Sauvignon Blanc. However, that should be changing over the next few years as the country's wine industry is aggressively trying to shift to Chardonnay, Pinot Noir, and Cabernet Sauvignon. Until then, the following are some of the best and easiest-to-find Sauvignon Blanc producers. The great thing is there are some wonderful values with distinctive wines less than $15, which makes it easy to forget the ubiquitous Chardonnay.